Oiled birch, and either horsehair or tampico fibre. Tampico is a vegetable fibre harvested from the Agave Lechugilla, a plant originally native to the parched highland deserts of northern Mexico - it produces a stiffer brush than the horsehair and is suited to light scrubbing whilst the softer yet more tightly packed horse is especially useful for delicate porcelain, being more similar in action to an exceptionally fine dish cloth. 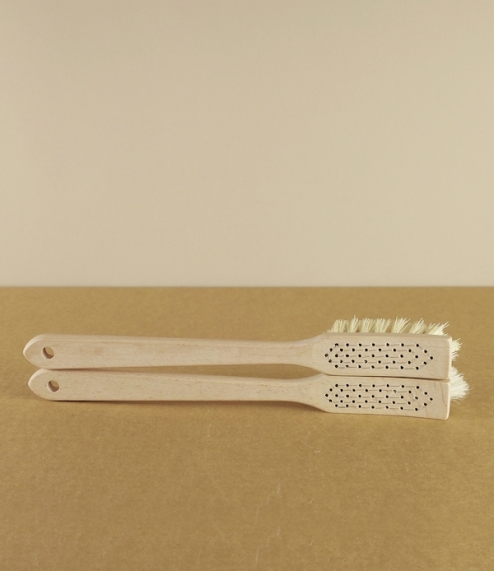 These brushes come from the workshops of Iris Hantverk in Sweden where visually impaired craftsmen find employment in the manufacture of wonderful brushes. About 30cm in length.